A Russian Soyuz spacecraft plunged back into the atmosphere Monday evening, carrying three space station crew members through a fiery descent to a frigid pre-dawn landing in Kazakhstan to close out a five-and-a-half-month stay in space. Departing Expedition 29 commander Michael Fossum, Japanese astronaut Satoshi Furukawa and Soyuz TMA-02M commander Sergei Volkov sealed themselves inside the ferry craft at 2:41 p.m. EST (GMT-5) and undocked from the lab's Rassvet mini research module at 6 p.m.
After testing an upgraded autopilot, Volkov, seated in the central descent module's center seat, fired the ship's braking rockets for four minutes and 16 seconds starting at 8:32 p.m., slowing the ship by 258 miles per hour to drop out of orbit. Twenty-five minutes later, the upper and lower sections of the Soyuz TMA-02M spacecraft separated and the central descent module fell into the discernible atmosphere around 9:02 p.m., using its heat shield to dissipate the heat of atmospheric friction. 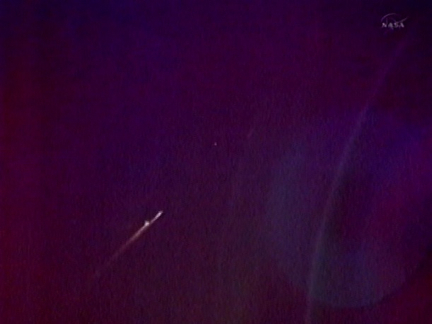 Dramatic television views from the International Space Station showed the fiery re-entry from space, with brilliant plumes trailing the two jettisoned modules well behind the manned descent module. The spacecraft's main parachute deployed on time at an altitude of about 6.6 miles and the spacecraft settled to a jarring, rocket-assisted touchdown at 9:26 p.m. (08:26 a.m. local time), settling on its side and closing out a voyage lasting 167 days six hours and 12 minutes since blastoff from the Baikonur Cosmodrome on June 7. Touchdown occurred about 32 minutes before sunrise in brutal winter conditions, with brisk winds, temperatures in the single digits and a half foot of snow on the ground. The Russians prefer daylight landings, but an earlier decision to delay the crew's departure by one week resulted in a rare pre-dawn entry. 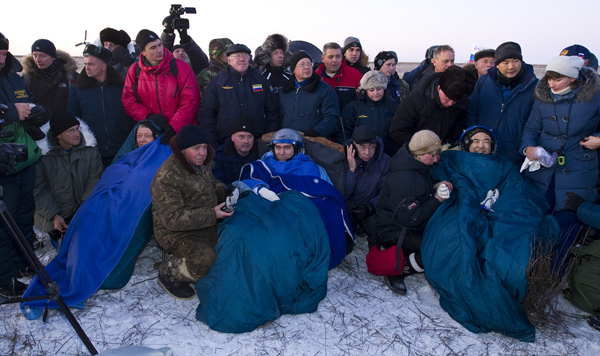 Recovery crews, including flight surgeons and NASA personnel, were stationed nearby and were on the scene within a few minutes to help the trio out of the cramped Soyuz. All three appeared to be healthy and in good spirits as they relaxed under heavy blankets in folding chairs set up near the capsule. 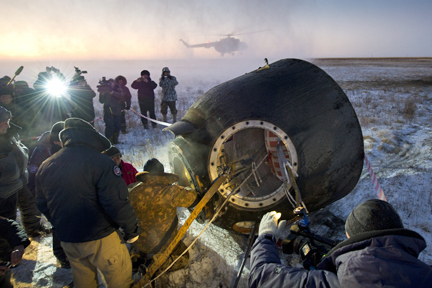 After medical checks, all three men were expected to be flown to Kustanai, about 150 miles from the landing site. From there, Fossum and Furukawa planned to fly back to the Johnson Space Center in Houston aboard a NASA jet while Volkov was to proceed to the Gagarin Cosmonaut Training Center near Moscow for debriefing and reunions with friends and family members. In a brief change-of-command ceremony Sunday, Fossum was relieved by NASA astronaut Daniel Burbank, who arrived at the station Nov. 16 with Soyuz TMA-22 commander Anton Shkaplerov and flight engineer Anatoly Ivanishin. "Sergei and Satoshi, this was my dream mission and you guys have been my dream crew," Fossum said. "I would launch with you guys on another mission in a heartbeat. Dan, Anton and Anatoly, you arrived at our door just a few days ago, well prepared and ready to spring into action. You are ready to take over. My only regret here is we had so little time to spend together." Burbank and his crewmates originally were scheduled for launch Sept. 22, but the flight was delayed in the wake of an August launch failure that destroyed an unmanned Progress cargo ship. As a result, Fossum's crew had just one week to bring Burbank, Shkaplerov and Ivanishin up to speed on space station operations. Fossum took a moment during the change-of-command ceremony Sunday to thank the crew's families for their support. "There are no words to express our gratitude to our families, who have endured much throughout our years of training and this mission," he said. "We call home excited about seeing countries at night in a blaze of light with a flicker of aurora on the horizon while they're dealing with kids, homework and cars that need repairs, the stuff of real life." Pausing a moment, Fossum said, "honey, I'm coming home." Burbank then took over as commander of Expedition 30. "Thank you for handing us over such a magnificent ship," he said. "Space station's in perfect condition, it's an honor and a privilege to take the helm. On a personal note, I'd really ike to recognize you, Satoshi and Sergei for all the hard work that you've (done) the last couple of months. "It's really been a whirlwind, but it's been a pleasure. I can't promise that I won't be calling you with questions here and there and I know you'll be there, ready to help us. Anton, Anatoly and I look forward to carrying on the proud legacy previous crews have laid before us. On behalf of the three of us, we'd like to wish you, Sergei and Satoshi fair winds, following seas and a soft landing." If all goes well, Burbank, Shkaplerov and Ivanishin will be joined by three fresh crew members -- Soyuz TMA-03M commander Oleg Kononenko, European Space Agency astronaut Andre Kuipers and NASA flight engineer Donald Pettit -- on Dec. 23, boosting the lab's crew back to six.